← Cheap Thrills: Produce. Produce. Produce. 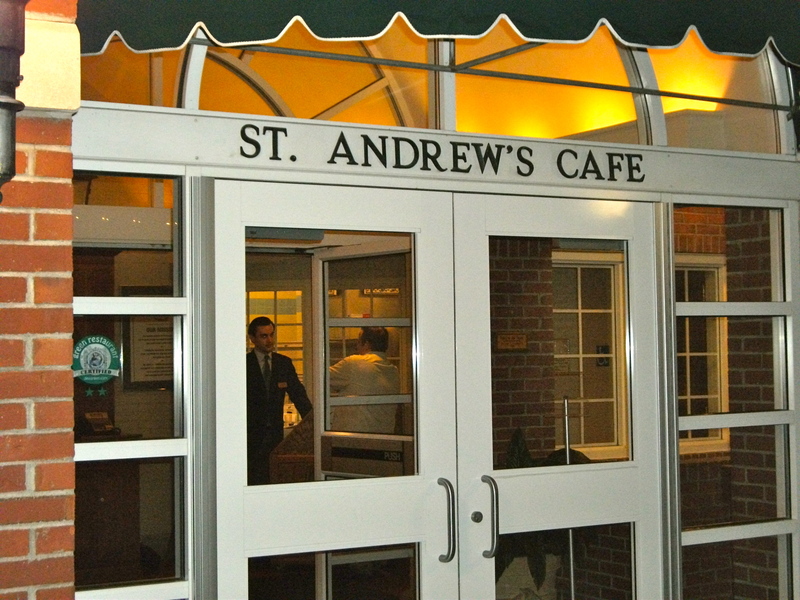 UpstateDowntown: How often does the menu change at St. Andrew’s? LiPuma: Seasonally, about 4x a year. Depending on what’s available, we may also change it a couple times within a season. 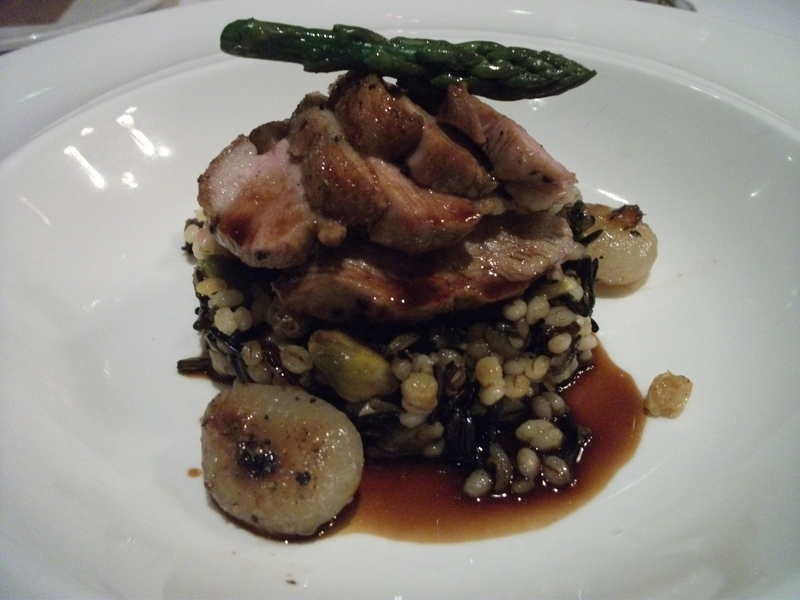 As a farm-to-table restaurant, menu offerings are frequently dictated by the weather. So, for example, an exceptionally warm or a long cold winter affects whether we’ll get sugar snap peas earlier or later in the season. We don’t change our menu more frequently because we also want to give our students some structure in the learning process. Upstate-Downtown: How much of the menu is locally sourced? LiPuma: About 70% in the spring; 80% in the summer and 50% in the winter. Upstate-Downtown: What is unique about St. Andrew’s as a learning environment compared to the other CIA teaching restaurants—American Bounty and Caterina de Medici—where you were previously a chef-instructor? LiPuma: At St. Andrew’s, we’re relying on a network of smaller producers and growers, so, there’s a greater level of unpredictability that students face. For example, we were supposed to get our ducks at 9am this morning. It’s after 11am, and they’ve only just arrived. That puts the students behind their prep schedule, increasing their stress level. And, now, the restaurant is about to open for lunch! This is the reality of the farm-to-table, and students have to learn how to adjust. UpstateDowntown: What are the challenges of running a green restaurant like St. Andrew’s? LiPuma: A big challenge is buying “local”, which we define as produce grown within 100 miles, and meats and poultry raised within 200 miles. Another challenge is getting our staff up to speed quickly. New students are always rotating through St. Andrew’s. So, every three weeks, I have a brand-new staff, all of whom have different capabilities, which I have to channel and focus into running a real, live restaurant. It usually takes students about three or four days to get acclimated to the way we do things here. Again, that’s why we don’t change our menu every day: the restaurant also serves as a classroom. And, as an instructor, my objective is to give students a more structured learning environment to help build their confidence. UpstateDowntown: How difficult is it for a green restaurant to stay within their food purchasing budget? LiPuma: Great question! It can be a lot more difficult for a green restaurant to stay within budget because of supply and demand. If demand is high and supply is limited, prices will be higher. Farmers can’t mass-produce what our restaurant needs. And farmers have bills to pay, too, like labor, electricity and gasoline. When these costs rise for the farmer, they’re passed along to us, and, ultimately, to consumers. When I buy organic or sustainably raised meats and fish, I have to pay more. And because I have a business to run, I can only hope that the consumer doesn’t mind paying a little more. It all comes down to supply and demand. 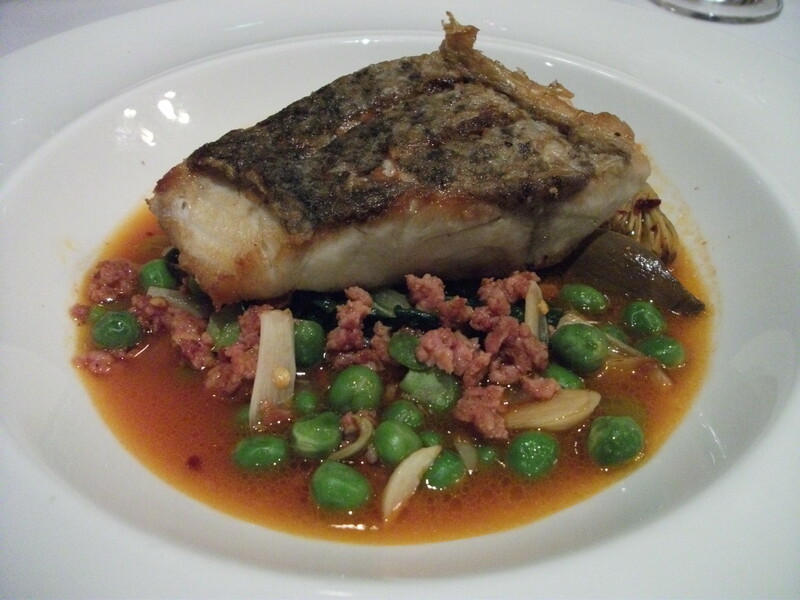 LiPuma: Beautiful, fresh food that’s alive. Imagine squash blossoms, stuffed with zucchini and freshly made goat cheese and served with roasted baby beets and carrots. All the vegetables were harvested right outside our front door. We’re offering this salad as a special right now. And most people don’t mind paying an extra $1 or $2 for it. UpstateDowntown: What are the biggest takeaways for students who work at St. Andrew’s? LiPuma: One big takeaway: buying close to the source can help keep costs down. For example, if I used organic asparagus in January or February it would cost me $4 or $5 / pound. But if I buy local asparagus when it’s in season (April or May), it will cost me $1.50 or $2/ pound. Another is that when you buy food that’s grown nearby, you don’t have to manipulate it as much. That asparagus from South America may look beautiful. But how “fresh” is it? From a farm in South America, it went to a warehouse. From the warehouse, it was trucked to the airport. From there, it traveled thousands of miles to another airport, then was transported to another warehouse, where it sat before it was delivered to me. Now, I have to make a hollandaise sauce to make that jet-lagged asparagus taste good! 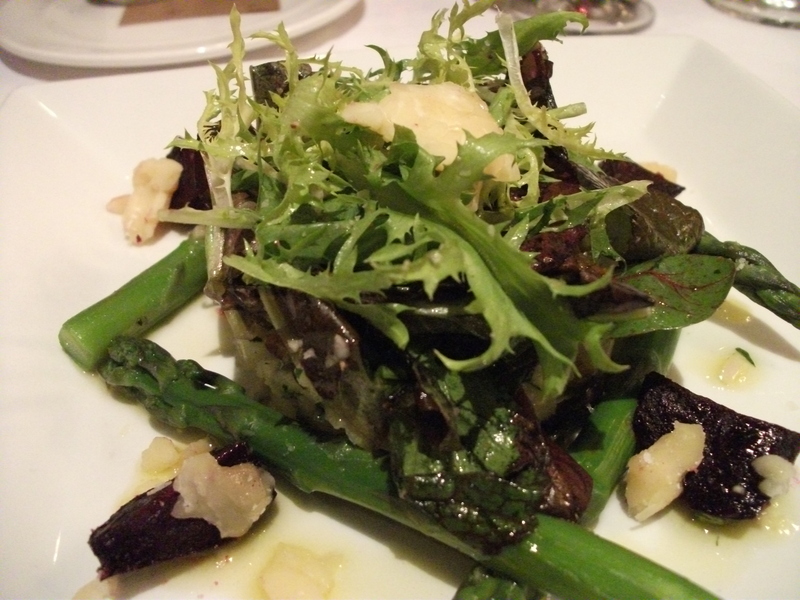 On the other hand, with locally grown asparagus, I need only drizzle a little olive oil for it to taste delicious. Students learn that they can stretch their produce dollar by canning and preserving local produce in different ways, like pickling, jams or compotes. You pay a little more upfront, but spend less during the winter when local produce is in short supply. With meats, students practice nose-to-tail cooking. When we buy a whole cow or a whole pig, we turn everything—even obscure animal parts, like tendon, hanger, flank, livers, trotters, feet, or the tongue—into something delicious. We also make our own charcuterie, like pates, chorizo and terrines, in-house. This entry was posted in Hudson Valley, Restaurants. Bookmark the permalink.